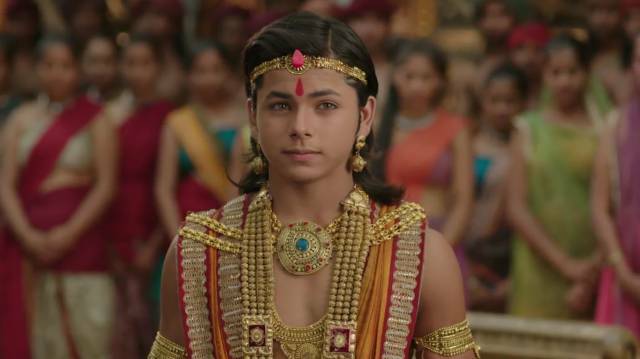 In the last night episode of the historical come periodic TV series “Chakravartin Ashoka Samrat” it has been shown that Sushim says, Ashoka, that he doesn’t believe in him. He says Ashoka kissed that and shoots that on Samraat. Ashoka says if he kissed that poisonous arrow then how he is alive today? Sushim gets afraid to hear so and now he is busy in preparing some more logic to present in the front of the Bindusaar to prove Ashoka wrong. Now Bindu shoots an arrow.Bindu notices there is some Unani has been apply in the sword. Bindu wonder who can do this and about this Ashoka says it may be Rajmata Helena. Ashoka says he has gone to the Rajmata’s room to solve his confusion. Now Ashoka and Kaurvaki go in Helena’s room and searched there. They shocked to see a large box there has been kept. Before they could find anything they are shocked to hear voice of the foot is coming and they gets hides. Now they shocked to see that it is Helena and Siamak come there and take that box and leaved from there. Ashoka and Kaurvaki see all this. Ashoka takes the name of Helena and Siamak. In the front of the Bindu. Bindu is no ready to accept that but they accept it when Kaurvaki also supports Ashoka. Now Ashoka explain the entire story to the Bindu that it was Helena who conspired to kill Ashoka himself but in this process Draupad get dead and Ashoka get blame. So Bindu order Helena to store in the jail and to make her reveal name of the person who helped her in her evil deeds. Dharma and Kaurvaki praised Ashoka as Ashoka succeffully reveal the truth and Bindu also seek apologised from him and decided to punish Helena as well to know name of the person who helped Helena. Whether Ashoka will be able to know name of the person who helped Helena in her wrong actions, find out in the tonight episode of the historical TV series “Chakravartin Samrat Ashoka” at 9:00 PM only on the Colors TV!! !